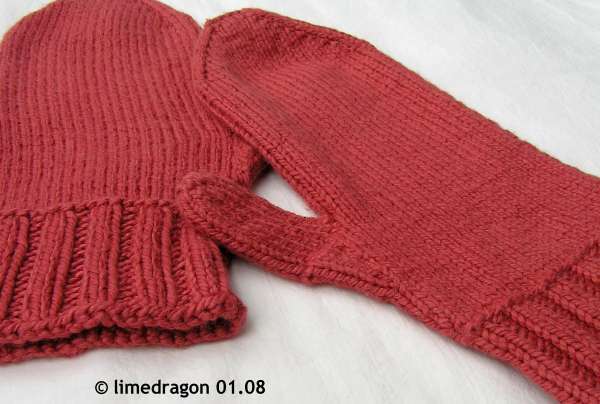 These were knit top-down, the first mittens I’ve ever done this way. I wanted to tailor them to fit Mom’s hands. And because she already knew she was getting mittens, I could try them on her hands along the way. 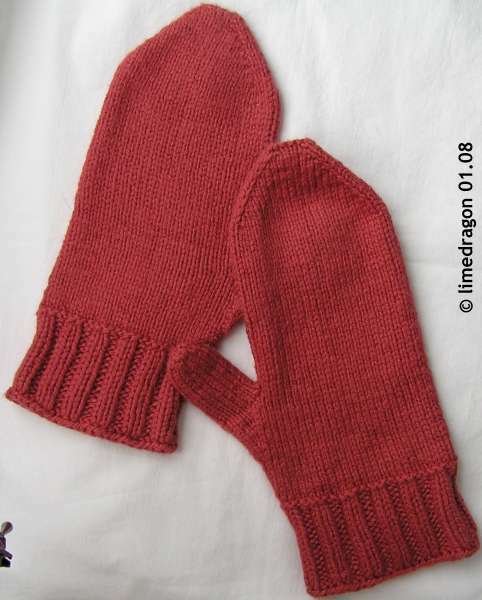 I’ve always liked to incorporate one garter ridge at the top of the ribbed cuffs on my mittens. 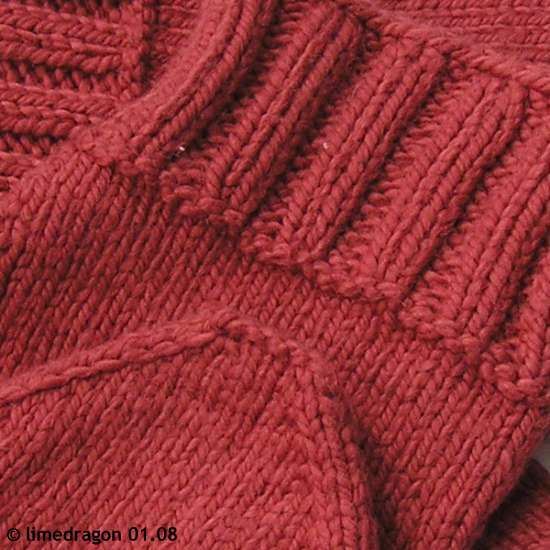 In order to match this ridge on the tips, I used a provisional cast on and knit one garter ridge, then started knitting in the round after knitting one row and picking up stitches from the cast-on. I’m quite happy with how this worked out, but would make the tip wider next time. 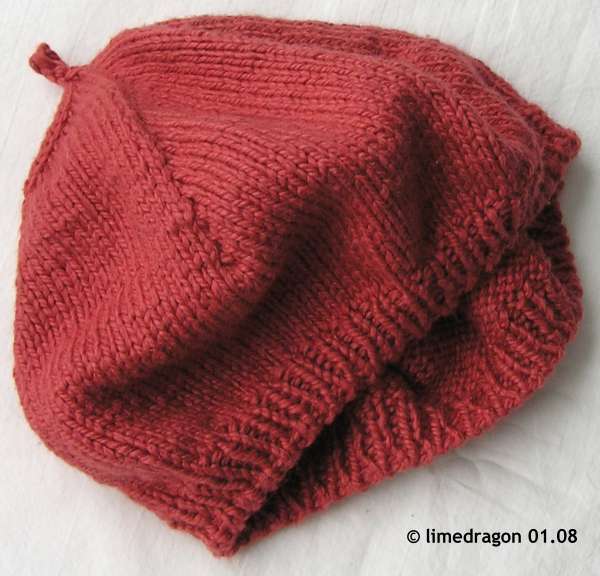 I also asked Mom to point out the hats she liked in Hats On!, so that I could knit a matching hat, yarn permitting. 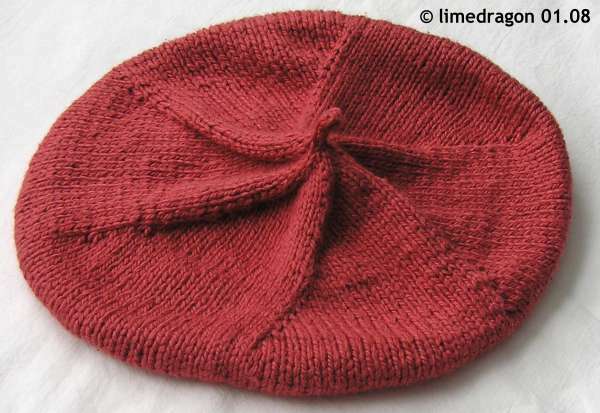 I chose the simplest one she liked, the Tam, since I was leery of yardage after the Gansey Watch Cap incident earlier this month. It turned out that there was plenty of yarn for a hat, whew. I was very surprised at how quickly this tam knit up! Because it wasn’t as floppy as I would’ve liked, I would consider this hat more of a beret. (Maybe I will try again, with a size medium circumference for the cuff, but increase to a size large diameter?) But, most importantly, Mom was really surprised and very happy with the tam, and it looked great on her! These were gifted just in time… the above picture was taken on Monday before we went out for her birthday dinner, and it rained. Then, the day after (Tuesday), temperatures plummeted with a severe wind chill, yikes! Very timely completion on those!! They look great. They look great. Today I’d even be tempted to layer those babies! What a great set! The mittens look really fantastic. What a beautiful gift. And I’m sure appreciated today. 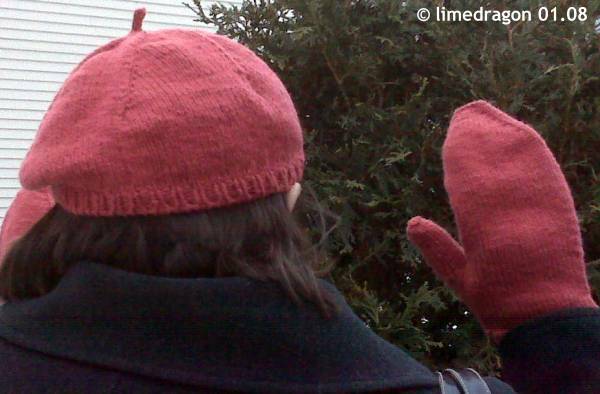 Great looking mittens and hat and you’re right – the timing is perfect with this unbelievable weather we’re having! very pretty…!!! I like that garter row above the ribbing. Those are so cute! I love the color. Lovely gift – perfect for cold days! Say Happy Belated Birthday to your Mom. Those are lovely gifts for your Mom. Love all the matching colors and the tam. Beautiful set! I like the added garter stitch ridge before the cuff. It really adds balance to the design. Hooray for handknit birthday gifts, they are tops. Yay for warm hands and head! What a great birthday present! I love the classic look of the set.